Sugar cookies. My Mom never made them. I don’t like them (or at least I thought I didn’t). Before this weekend, I attempted making sugar cookies exactly once, from a packaged mix, and they turned out like giant formless blobs and I hated them. I don’t think I even tried decorating them before they hit the trash. But that was then, and this is now. I am older, more mature, and all about broadening my culinary horizons finding as many ways to create and ingest sugary cuteness as I possibly can. And it seems that along with cupcakes, people are totally into sugar cookies these days. There are so many amazingly creative cookie artists out there!! Marshall’s sweet wife Kelley gave me a stack of home-decor magazines a while back, and I had already gone through and torn out the pages that I wanted for inspiration..but didn’t want to waste the magazines by just trashing them. So I googled magazine crafts, and stumbled onto Patricia Zapata’s site – A Little Hut. She was making bowls and coasters out of magazines, but that didn’t really interest me. Her how-to on making your own matchboxes looked pretty awesome, though! But what would I do with a bunch of oversized, pretty matchboxes? I would fill them with beautiful little sugar cookies shaped like flowers, and hand them out as thank-you’s to everyone who came to my “garden party” themed baby shower, that’s what! And I have to say, I really love how the boxes turned out. 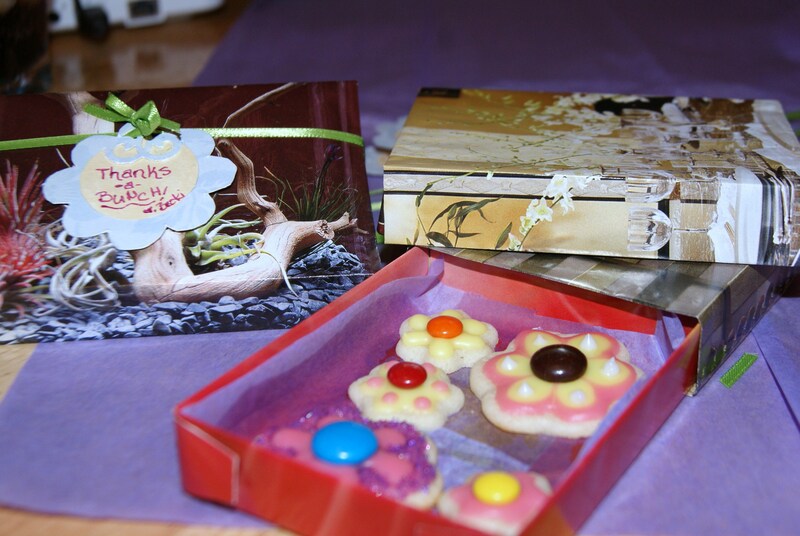 I love them housing beautiful little cookies, too. But we’ll get to the cookies in a minute. Pretty cool, huh? I basically followed Patricia’s Tutorial to the tee, except that I reduced the template size to 75%, and instead of using cardboard or cereal boxes, I used magazine pages. I glued 3 pages together to make the main box portion, and one page for the sleeve. Great recycling project – favor boxes are EXPENSIVE. These boxes? Free-ninety-nine, if you have friends who give you their old magazines. Love it! Then I lined the bottoms with wax paper (I started out lining them with tissue paper, but quickly realized that was a mistake), added my cookies and covered them with a little sheet of tissue paper. I made my own “thank you” tags with cardstock and ribbon – I wrapped the ribbon around the boxes lengthwise to ensure the cookies didn’t fall out of the sleeves during transportation. Now let’s talk sugar cookies! I have been drooling over I Am Baker‘s beautiful sugar cookies for a few weeks now. Not so much drooling in the tastebuds sense (because as I mentioned before, sugar cookies have never really done anything for me in the past) but I really, REALLY wanted to make some beautiful, artsy cookies like Amanda‘s! So I used her self-titled Amazing Sugar Cookie recipe because she asserts that this is, and I quote, “by far the best sugar cookie recipe ever.” How could I go wrong? Well, lots of ways, actually. I’ve been studying up on these sugar cookies and learned that they could be quite tricky. That’s how I stumbled onto Gail Dosik’s (aka THE Tough Cookie) “Between The Sheets” tutorial. 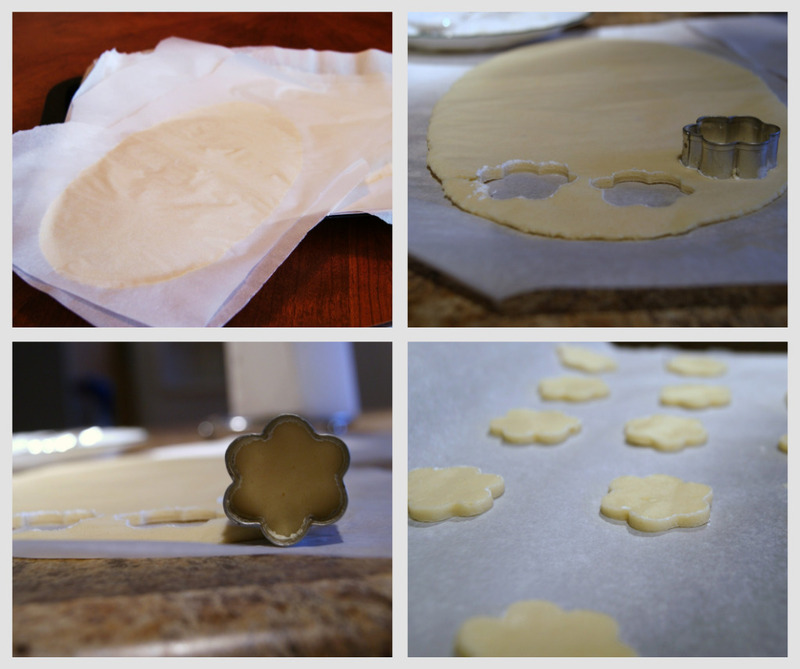 Even though I had only tried sugar cookies once before, I knew this method was going to make all the difference. And it TOTALLY DID. 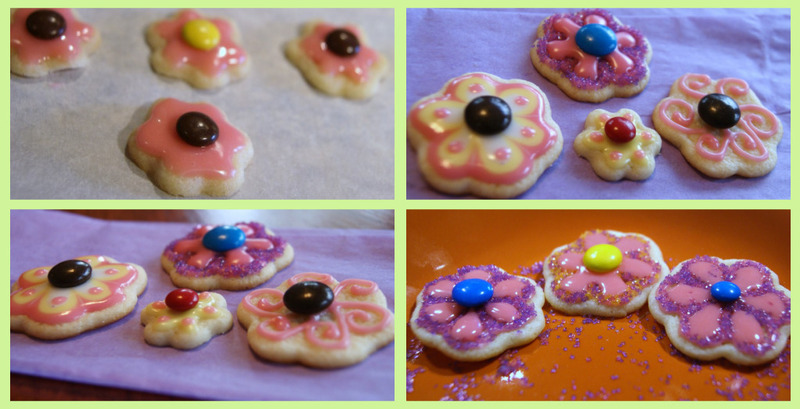 Follow that link and use her method next time you want to tackle sugar cookies – it will make your life so much easier! The basic idea is that you can use any sugar cookie recipe you like, but once you have your dough all mixed up, you divide it into more manageable scoops, lay those scoops out onto parchment paper, top them with another sheet of parchment paper and go ahead and roll the dough out between the sheets. Then put the rolled out sheets in the freezer for a half hour or so. Peel the sheets off (top AND bottom – I tried to only do the top first and the shapes would not come off the bottom. So loosen that bottom sheet before you start trying to cut out shapes! ), dip your cookie cutter in flour and go to town. Easy. I also went to I Am Baker for my icing recipe. More to the point, I made Amanda’s Awesome Icing. Now, I still won’t be going out and buying sugar cookies for myself, but I will say that I loved the way these tasted (I used M&M’s as part of my decorations – the little hit of chocolate moves these cookies up quite a bit in my book!) and I will definitely be making them again. And again. 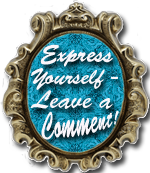 There is so much creative, fun stuff you can do with sugar cookie decorating…the possibilities are endless! And with these no-fail recipes and the super simple method, I got to put the majority of my time and energy into the part of baking I love best – the decorating! I realize my cookies aren’t going to win any awards for creativity or perfection, but for my first effort – well, I’m hooked. And hey, if *I* can befriend the sugar cookie, anyone can. So hop to it! Coincidentally, my baby shower was amazing. I have the best in-laws a girl could ask for, as well as an amazing group of women who love and support me. I am truly blessed, and grateful. they look GREAT! i always burned sugar cookies until my MIL gave me a sour cream based sugar cookie recipe that’s unstoppable (though i’ve sworn to her my secrecy)… mmmm! thanks for the link to the icing – i always see the shiny frosting but never knew how to achieve it! Wonderful review!! I love that you researched it and went into it with a plan!!! Makes all the difference. *sniff sniff* I’m so proud. SO proud!